The bouquet of n circles has a special place in my heart. I guess I should say the bouquets of n circles have a special place in my heart because for every whole number n, there is such a bouquet. Also called a wedge of n circles or a rose with n petals (even though it usually looks more like a daisy), this space consists of n circles that all meet at one point. We think about this space topologically, where exact shapes and distances don’t really matter, so usually in pictures, the “circles” are deformed a bit. Otherwise they would overlap when we tried to draw them in a plane. The reason I love this space so much is that it’s an example of topology yielding an insight into algebra. Algebra, which is basically the study of symmetry and structure, is an incredibly useful tool in topology, but its a little more rare for topology to be applicable in algebra. To see why, we need to visit the fundamental group. The fundamental group is, well, a fundamentally important tool topologists use to distinguish and describe spaces. The fundamental group describes the kinds of loops you can draw in a space. Two loops are considered the same if you can wiggle one of them around to the other one while remaining in the space. Any two loops in a disc or plane are equivalent in this way, so their fundamental groups are very boring. But in a space like a torus (the surface of a donut), there are loops that can’t be wiggled around into each other, and the fundamental group has a little more going on. In a bouquet of n circles, loops can be identified by what circles they travel around, in what direction, how many times, and in what order. For example, in a bouquet of 2 circles, or figure 8, there is a loop that goes clockwise around the left circle once and then the right circle. This loop isn’t the same as a loop that goes around the right circle and then the left circle because there’s no room in the space for you to manipulate one loop and turn it into the other. (You can use rubber bands to convince yourself of this fact.) In the picture below, the loop that goes clockwise around the left circle is labeled a, the loop that goes counterclockwise around the right circle is labeled b, and we define a-1(pronounced “a inverse”) to be the loop that goes counterclockwise around the left circle and b-1 to be the loop that goes clockwise around the right circle. The fundamental group of the figure 8 can be represented by all finite strings of a, a-1, b, and b-1. (You should be a little suspicious I snuck “finite” in there because I never told you the rigorous definition of a loop requires it to have a finite length. Now I have.) If you get an a next to a-1 or b next to b-1, you can cancel them out. The fancy way to describe the fundamental group of the figure 8 is the free group on 2 generators. The generators are the letters a and b, which automatically come with their inverses, and the word free refers to the fact that, other than putting a letter next to its inverse, there’s no way to cancel out any sets of letters that appear next to each other. There are groups in which these cancellations can occur, but a free group isn't the place for that. 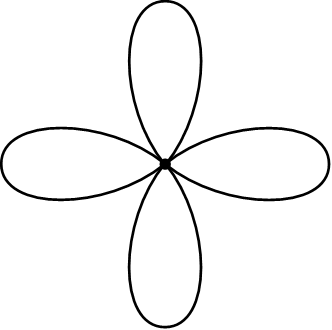 Just as the fundamental group of a figure 8 is a free group on two generators, the fundamental group of a bouquet of n circles is a free group with n generators. It seems pretty pedestrian until you get to use these bouquets to prove a really cool and, to me at least, counterintuitive fact about free groups: the free group on 3 generators is a subgroup of the free group on 2 generators! More generally, the free group on n generators is a subgroup of the free group on 2 generators. That’s counterintuitive to me because it sure seems like 3 generators should give you a “bigger” group than 2 generators would, and subgroups seem “smaller” than the groups they are subgroups of. But these intuitive notions often go out the window when it comes to infinite things like free groups. I struggled to get through the topology qualifying exam in graduate school. (Quals or prelims are the exams most graduate programs require students to pass before they officially move on to the research and dissertation portion of the degree. Usually students are expected to pass in the first year or two of their graduate program.) Because of that struggle and the extra time and effort I spent with that material, it’s probably the only qual I could still pass today! One of the last things I studied the night before the exam was a section at the very end of the textbook about free groups and bouquets of n circles. I think we had covered the material in class, but it hadn’t stuck then. It was probably my nth time reading the section and trying to understand it for a fairly large n, but this time was different. I don’t think the heavens actually opened up, but I do remember that click and the lightness I felt when I finally really understood the big ideas in the section. The next morning, the exam happened to have two questions about the material I had just studied. I felt very lucky to have studied just the right thing before I closed my book for the night, and I’ve been grateful to bouquets of circles ever since.